Daniel Weinman had his 29th birthday on February 3rd. What did he get on his special day? His first World Poker Tour title and a $892,433 payday. “I turned 29 today, so this is a pretty awesome birthday present. My girlfriend flew in last minute, you couldn’t have scripted it any better,” Weinman told WPT reporters after coming out on top. 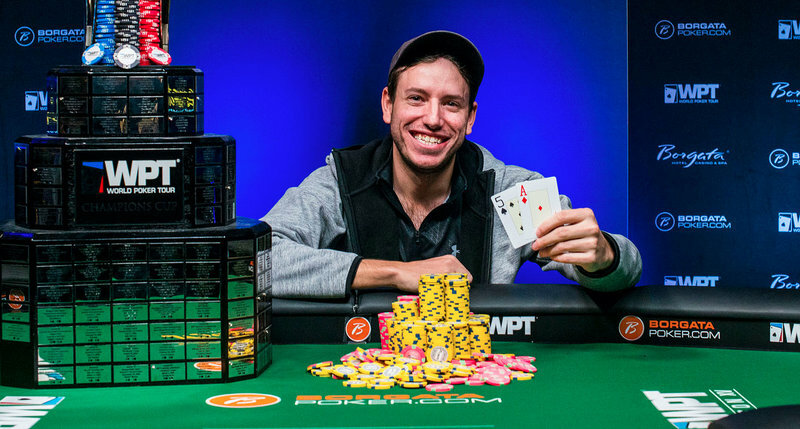 Weinman, a poker pro from Alpharetta, Georgia, defeated a field of 1,312 entries to take down the 2017 WPT Borgata Winter Poker Open $3,500 no-limit hold’em main event. In addition to the title and the money Weinman also earned 1,440 Card Player Player of the Year points. As a result he flew up the leaderboard, landing in seventh place in the overall POY race standings, which are brought to you this year by the Commerce Hotel & Casino. Weinman came into the final table in fourth chip position among the remaining six players. He got off to a solid start, winning seven of the first ten hands at the final table. In the 26th hand of the night Weinman got all-in with A A against Richard Foster’s K K on a J J 5 flop. Weinman ended up with aces full, sending Foster to the rail and moving into second place on the leaderboard. Weinman was able to take the lead as play became more shorthanded, and the key pot that really set up the win came during three-handed play. With blinds of 75,000 – 150,000 and an ante of 25,000 Tyler Kenney raised to 350,000. Weinman three-bet to 1.2 million from the big blind and Kenny made the call. The flop brought the 8 5 4 and Weinman checked. Kenney bet 1.4 million and Weinman made the call. The 10 hit the turn and Weinman again checked. Kenney cut out a bet of 3,005,000 and slid it into the middle. Weinman thought it over for a moment before electing to call. The 3 completed the board and Kenney went into the tank before moving all in for 10,610,000. Weinman, who had Kenney covered by roughly a million, thought it over for a few minutes before making the call with the 9 5 for a pair of fives. Kenney could only produce the K 9 for king high, and just like that he was eliminated in third place ($327,578). With Kenney out Weinman took more than a 6-to-1 chip lead into the final heads-up showdown with Nathan Bjerno. Despite the lopsided chip distribution to start the two managed to play 50 hands before it was all over. Bjerno mounted several small comebacks but was never able to overcome the huge chip disadvantage he started with. In the end Bjerno got all in with A 4 against Weinman’s A 5 . The board ran out A 8 6 7 4 to give Weinman the pot and the title, sending Bjerno to the rail as the runner-up. He earned $524,964 for his deep run. Winner photo courtesy of WPT / Joe Giron.